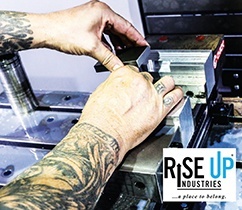 Rise Up Industries (RUI) is a nonprofit organization providing a comprehensive approach to eliminating gang violence and gang membership, training prison-released members to be computer numeric control (CNC) machine operators and productive citizens. The machine shop is a social enterprise which provides high quality manufactured components, CAD prototypes and completes quality inspection. We manufacture fittings and machined parts from a variety of materials, including aluminum, plastic and steel. Contracted work provides members with production experience and generates revenue to help offset operating cost. RUI Machine Shop is equipped with the latest Haas CNC equipment: Haas TM-1P; Haas Super Mini Mill; Haas ST-15Y Lathe; Haas VF-2SS Mill; and Haas VF4SS. We program our machines with the latest Master-Cam CAD/CAM software. 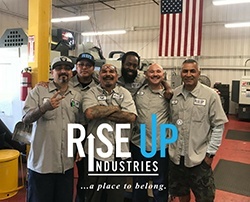 Rise Up Industries - a place to belong.